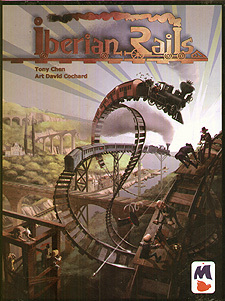 In Iberian Rails, players invest in and manage six fictional railroad companies set in Spain. Each round, players select characters using an original character-row mechanism. Then, using the character they selected, each player controls the companies they own the most shares of to take actions. The actions include: building tracks, publicly selling a share plus dividend payout, and secretly selling a share plus dividend payout. Timing is everything. By making a company pay out dividends early, said company's long term growth may be compromised. However, investors in that company can get cash into their hands sooner, perhaps just in time to invest in another company. Time your investments, company payouts, and successive character selections to maximise profit. At the end of the game, the player with the most money wins.